Ever since Bioware got onto this "all personal story, all the time" tack for Knights of the Fallen Empire, people have been moaning about the lack of attention being paid to group content. Over a year since the last operation! Nearly two years since the last new warzone! Where are the new flashpoints!? Etc. And yet, despite of being someone who really enjoys group content, I've stayed fairly quiet on that front. I'm almost a bit ashamed to admit it, like I'm letting the team down or something, but it honestly hasn't bothered me that much. I love how they've equalised all the operations in terms of loot (even if the system isn't without its flaws), as we rarely run the same operation two weeks in a row now. There are over a dozen flashpoints to tackle while levelling and at endgame, on multiple difficulties. If I get tired of them, I do some PvP instead and vice versa. Seven different PvP modes spread out across ten different maps are not too shabby either. It seems to me that you would have to be pretty single-minded in how you play to run into serious problems with repetition, and I'm not. Mind you, all of this isn't to say that I don't want to see new warzone maps, flashpoints and operations of course. Just that my enjoyment of the game doesn't hinge on those things in the same way that it seems to for others. There is one type of group content that I don't see getting much attention from either devs or players though and whose absence I've been very painfully aware of since 4.0: regular quests that have been designed with (optional) group play in mind. My pet tank and I have spent many, many hours levelling alts together, and the release of a new patch or expansion was always something that we looked forward to tackling together. 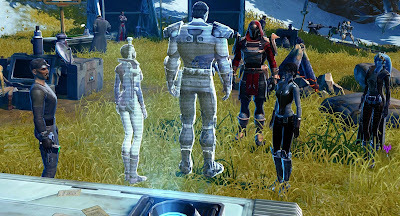 Our grouping experience started to show its first cracks in Shadow of Revan with its numerous personal phases, but at least there were still some missions and conversations to be had outside those phases at the time. When KotFE released, we both sat down at our PCs together, launched the first chapter simultaneously... and then played through the entire story on our own. It wasn't much of a social event. Where previously we would have gone on to level up our next set of alts together, we were simply at a loss. There just wasn't any new levelling content that supported us actually playing together. To be clear, I'm not begrudging the KotFE story its solo-centric nature. As I've said before, I basically view it as a continuation of the class story in terms of overall style, and that was also a solo affair from the start. But I miss everything around it, the planetary story arcs and even the "stupid" side quests. They added much-needed perspective: Your character is a big deal but not the centre of the universe, and there are small people with their own concerns all around you. It gave flavour to the world. More importantly for me though, they were open to group play. If you've only ever quested on your own, you may not know this, but many regular quest givers actually have little bits of extra dialogue if you approach them in a group, usually along the lines of: "Wow, so many illustrious characters at once, it must be my lucky day!" These missions supported a full group of four participating in the cut scenes while striking cool poses. It was the most amazing thing to me. In fact, if you've ever read my "about" page, it does say there that the group conversation system was the whole reason I got into the game. I'd heard about SWTOR before then and didn't give a fig about it, Star Wars or not. Until I saw this video, that is. If you can't be bothered to click the link, it's a dev walkthrough from 2011 that shows some Imperial characters questing together on Tatooine. I can't emphasise enough how amazing I thought the group conversation system was. Only months before, I had played through WoW's Cataclysm expansion, and I remember doing this quest in Hyjal where you had to interrogate a harpy about something. I was in a group and my questing partner just clicked through the dialogue quickly, causing the harpy to fly away again before I'd had a chance to read any of it. As someone who actually cares about the story, I was livid. This isn't a particular failing of WoW's of course; most MMOs don't give much thought to how to maintain a coherent story experience while in a group. It's as if the devs think that "likes story" and "likes to group" are polar opposites that nobody could possibly be interested in reconciling. But SWTOR did, and while other, newer MMOs like The Secret World or ESO have also "copied" its cinematic storytelling, as far as I'm aware the stories in those games are still always single-player affairs. Nobody else that I've heard of has attempted to make quest interactions interesting while in a group, and now the system is falling into disuse even in SWTOR itself. The Star Fortresses are the most striking example. Their prequests can be done in a group, and you get to roll off as usual in the little scenes, such as before you blow up the shield generator. However, as soon as the cut scene plays, you are alone! It seems that they haven't even been designed to accommodate more than one character! My pet tank and I joked about this ("I guess you must have put me in your pocket before running outside") but really, it just makes me sad. Last year MassivelyOP asked their readers about the best MMOs for duoing, and SWTOR got a lot of mentions in the comments, even though it wasn't particularly popular with the crowds at the time. And hey, the original game is still very duo-friendly (except that the overall difficulty of the levelling content has been nerfed to a point that running around as a duo can feel a bit like shooting fish in a barrel). 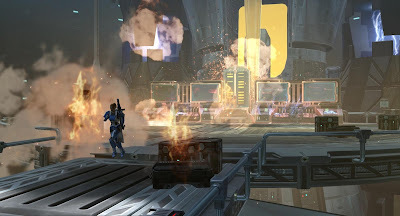 But the newer content most definitely isn't, and it breaks my heart to see Bioware discard one of the game's most unique and social features with seemingly nary a thought. I enjoy the personal story, but I really miss there also being a story that I can play through with a friend. This is the looming clouds on the horizon for me. I've loved coming back to the game since the autumn last year, especially the return to duo/trio levelling with friends. As you say the way the original content handles this, with the exception of the class stories, is second to none in the genre. Of course I've read on your blog and elsewhere that it gets inceasingly difficult to play this way post level 50. We have two groups of characters in the 40s now so it's nearly time to decide what to do over getting access to Makeb. One month's sub isn't much of course to the two friends I mostly play with (I'm currently still subbed anyway) but they may not be so keen if they realise just how little after Makeb they can play solidly as a group. My only complaint about the old grouping content is that it was so watered down. That's why I think the KOTFE chapters are so good. They're personal, and focused, and things you do have this weird way of sticking around with you. With that in mind, I wish they'd update the group questing the same way they've updated the solo experience. Like make a Havoc Squad situation, but the members are all real people. Then have a story that progresses with that group. Like, not a raid or a flashpoint. An actual story that progresses in chapters, just like the solo campaign. With lasting choices. With bad guys that recognize you as a group and are trying to take you down. If it's something like that, I think it'd be worth the dev focus. But if it's just more generic questing that's vague and watered down to account for 1-4 people maybe participating, I'd rather pass. It WAS kind of cool, especially compared to other MMOs But it wasn't THAT great. It could be much better. Sounds like what you really want is a virtual version of a proper roleplaying group. I don't think the tech for that is quite there yet, and even if it was, that would probably be a large enough departure from anything that's come before that it would be worthy of its own game. The KotFE chapters aren't really a big departure from the previous class stories, mainly they just have much better cinematography. I'm not saying there's no room for improvement in the way they did group questing, but the point is that it was apparently already too much work as it was! Which is a real shame, as it was fun and - even if basic - still much better than anything else in the genre.